Fundbox provides an easy solution for both small businesses and freelancers who need quick access to capital. 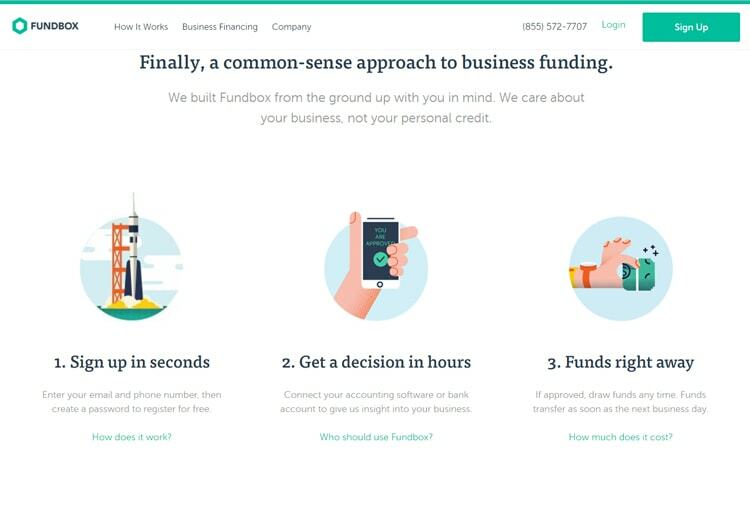 With a simple application, Fundbox delivers invoice financing for up to $100,000 to customers in as little as one business day. The company blends technology with finance by connecting their system to prospective borrowers’ accounting software or business bank account to quickly analyze financial patterns. Fundbox was founded in 2012 in San Francisco, California as a fast financing platform for small businesses. The company provides an easy solution for both small businesses and freelancers who need quick access to operating capital. 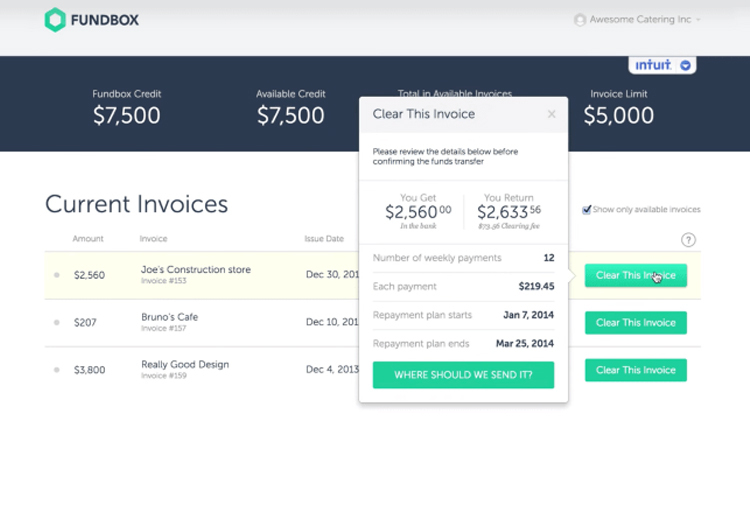 With a simple application, Fundbox delivers invoice financing for up to $100,000 to customers in as little as one business day. The company blends technology with finance by connecting their system to prospective borrowers’ accounting software or business bank account to quickly analyze financial patterns. Clients’ overall business health is assessed, generating a credit decision within a few hours. The company only has access to the business account provided by the client, enabling customers to avoid mixing their business with their personal creditworthiness. Many small businesses can find it difficult to receive short-term credit under $100,000 from a traditional bank, and especially with less than stellar credit. Fundbox can help these companies by providing flexible small business invoice financing or line of credit up to $100,000 quickly and efficiently. The company focuses on a company’s financials for approval instead of requiring the owners’ personal credit score to get started. Applying and registering for Fundbox is quick and simple. Instead of requiring a traditional credit check to get started, the company will sync to a company’s accounting software or business bank account to give a credit decision within hours. If approved, customers can receive their funds as soon as the next business day, which is helpful for small businesses that thrive on their own financial resilience. The company’s fees and repayment terms are also focused on short durations, offering quick opportunities for businesses to alleviate any funding crisis that could arise from unpaid invoices. Should customers repay their financing early, Fundbox will waive any outstanding fees. One of Fundbox’s biggest advantages is their quick and painless application process. To get started, new users are asked to create an account with their email address and phone number. 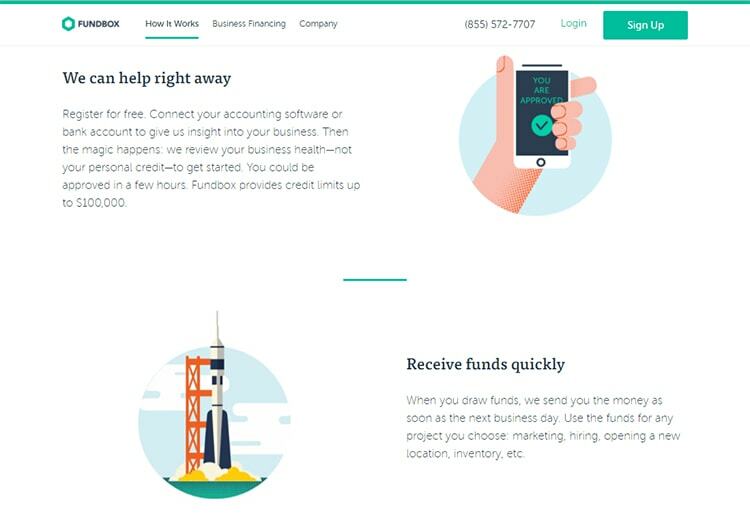 Afterwards, prospective borrowers connect to Fundbox via their preferred accounting software or business bank account so the lender can accurately evaluate all the available financial information. The company accepts most major accounting suites, but it is not compatible with Excel spreadsheets. Businesses whose financial software is not compatible with Fundbox’s platform can instead connect their bank accounts for analysis. Once synced with Fundbox, the company’s unique system will analyze a borrower’s finances and assess their business’s health. If approved, users can request funding, which can be made available as soon as next day. The whole process is incredibly intuitive, and companies can rest easy knowing they could quickly access the capital they require, if approved. Unlike many of its competitors, Fundbox is focused exclusively on short-term lending. The company’s invoice financing and line of credit gives customers a swift funding turnaround and repayment term that lasts less than six months. For many smaller businesses, this short-term solution is an ideal way to cover gaps in operating capital that can be detrimental to their growth or raise costs elsewhere. Thanks to this emphasis on shorter repayment periods, Fundbox’s interest rates can be slightly higher than the industry average. This balances out, however, as companies can usually repay these loans once their invoices have been covered. Fundbox does not charge any fees for prepayment and will waive any remaining fees if loans are repaid early. The company’s fees are divided into two main categories: 12-weeks and 24-weeks, each paid weekly. Fees for the former start at 4.66%, with APRs ranging from 16.40% to 67.70%. It is important to remember that while the rates may seem high, the short repayment terms mean that customers will not necessarily have to pay an exorbitant amount in interest. Fees for 24-week repayment start at 8.99%, with APRs between 18.50% and 76.50%. The company charges flat fees that are spread out over the life of the loan, instead of front loading them, meaning that customers can avoid any outstanding fees if they repay their financing before the term expires. Along with their flat fees, Fundbox offers quick term durations that help companies exit from debt quicker. The company only offers two repayment terms—12 and 24-weeks. It would be nice to see a wider variety of repayment terms, but the company’s financing solutions are structured to help customers repay financing before the periods expire. Moreover, customers can take advantage of Fundbox’s early repayment fee waiver to lower the total cost of their loans. 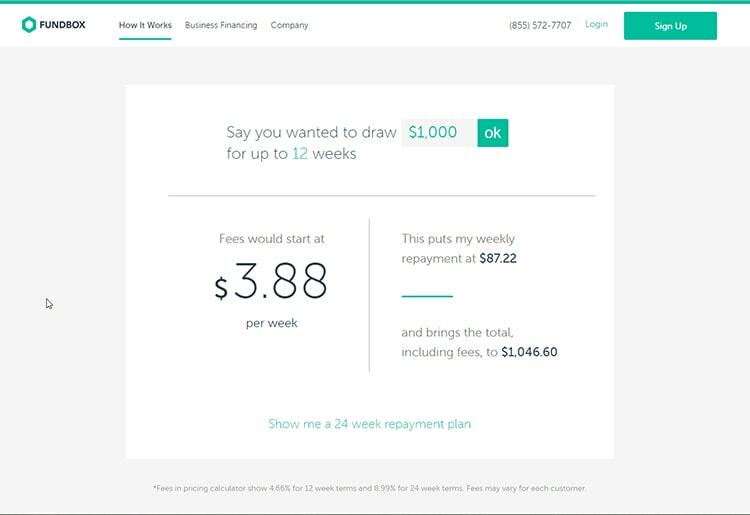 To help customers better understand their potential loans, Fundbox hosts a helpful payment calculator based on their rates, making it easy for a potential customer to review what their weekly costs might look like. Fundbox does not charge origination fees, maintenance fees, draw fees, or bank wire fees, but does charge a fee for late payments. The company uses automated payments directly connected to customers’ bank accounts, but insufficient funds may lead to charges that are triple the weekly fee. Assisting customers is a major focus for Fundbox, which takes their service quite seriously. The company’s support center features an extensive range of questions that cover more commonly occurring issues to rarer problems. Additionally, customers can email the company, which usually responds within 24 to 48 hours. Fundbox also offers a toll-free line that is available on weekdays between 8:00 AM and 8:00 PM. The company’s support representatives were all well-trained, and capable of answering our queries promptly. 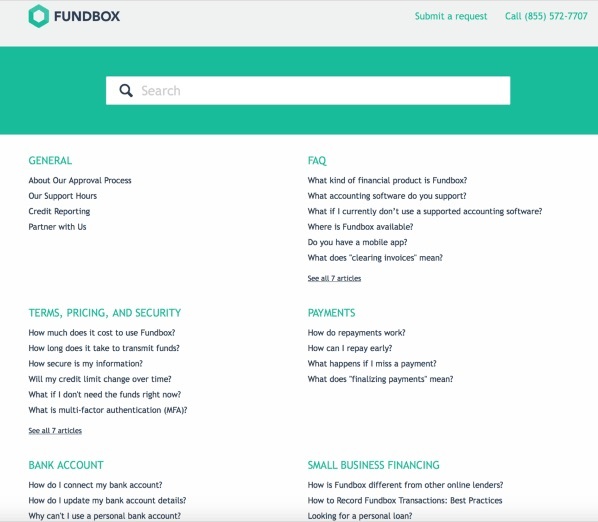 Fundbox has created a unique platform for small businesses to access financing. The company’s innovative underwriting system creates a more accurate picture of a companies’ financial health and simplifies the credit decision process. Their method of automated invoice forwarding is ideal for small businesses and freelancers looking for quick financial relief while maintaining their relationships with clients. For businesses which may struggle to access financing due to personal creditworthiness, Fundbox’s offer of small loans under $100,000 without a standard credit check required to get started may prove especially attractive. Furthermore, straightforward repayment schedules which are automatically debited from the business’s bank account give business owners one less thing to worry about. Small business owners will surely find Fundbox to be an excellent tool for fast and effective financing.